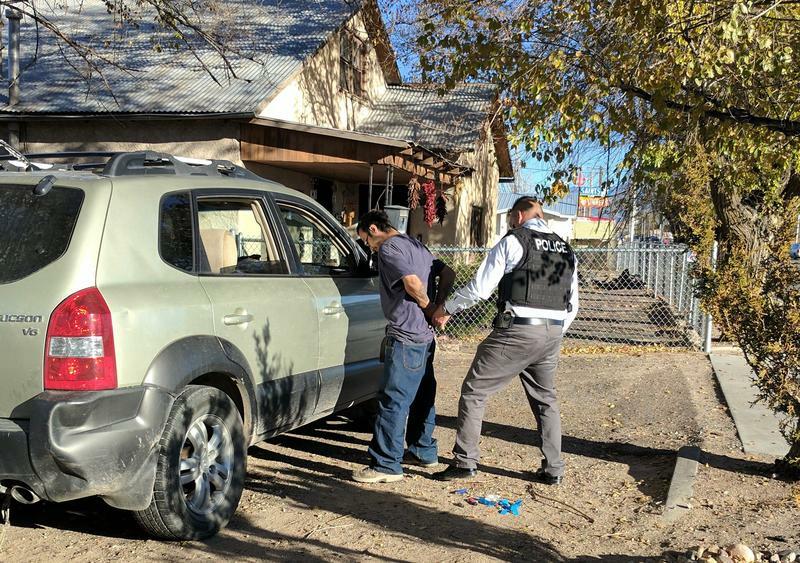 Española police make a drug related arrest. When a public health crisis gets out of control, it can overwhelm law enforcement agencies. That’s what’s happened with the Española Police Department as it deals with a decades-old opioid epidemic and all the crime that goes with it. To understand just how big of a drug problem Española has, just ask Officer Anthony Armijo. If there’s any police department that understands what an opioid epidemic means for a community, it’s this one. Even the chief of police has had addiction struggles within his own family. This town of 10,000 people has one of the highest opioid overdose rates in America. Heroin addiction has gone on out of control here year after year. It’s a crisis that’s torn families apart, strained the health system, and stretched the police department to its limit. At around 4 p.m. on a rainy Friday afternoon this past Fall, a call came in from dispatch. There was a break-in in progress at a vacant house. Police thought it might be someone who robbed a Baskin-Robbins with a knife earlier in the week. In a trailer park right next to the high school, some neighbors called it in. There were three police. Officer Armijo went around the back. They thought the guy was still inside, and their guns were drawn. They were waiting to either break down the door or see if he came out. Inside police found drug paraphernalia with heroin residue on it, but the person who broke in got away. Officer Armijo said these kinds of crimes happen all the time—heroin addiction can drive people to get money for drugs however they can, even if it means robbing a store or breaking into a home. These kinds of drug-related crimes are way more common than they should be in a town this size. But Chief Richard Gallegos said most of the people his officers arrest for drug-related crimes are genuinely good people who just need help getting out of addiction. “You meet the families, and they’re crying out for help,” he said. But Gallegos said more often than not, there’s no help to be had. Rehab, recovery and detox programs are over-capacity and underfunded—and without that kind of help, a lot of people end up getting arrested again and again. High crime and a revolving door of addiction and incarceration is a problem the Española Police Department is not equipped to handle. The police force has been cut in half over the last three decades, and now there is only one detective assigned to felony narcotics cases. In a small town like this, there’s just not enough tax revenue coming in to give police the funding and manpower they need to deal with the area’s huge problems with addiction and crime. Until six or seven years ago, people in Española may have felt alone in this problem. Not anymore. “It truly is a nationwide epidemic, and departments all over the country of all sizes are having extraordinary difficulty coping with it,” said Jim Pasco, director of the country’s largest police union, the national Fraternal Order of Police. Pasco said the opioid epidemic that has exploded in cities and towns across America in recent years has put a serious strain on police departments everywhere. And just like in Española, most of the rest of the country has fallen short on the detox and recovery programs that could help people out of addiction and stop drug-related crime. “We need to invest to a far greater degree than we do today in mental and physical health professionals to help treat these people, who have in many cases, through no fault of their own, become addicts,” he said. According to Pasco, there’s a broad consensus on the need for mental health and addiction services in police departments across the country. But even as the opioid epidemic continues to grow nationally, funding for those programs is still way too low to meet the need. This series, Enduring Addiction, was produced as a project for the Dennis A. Hunt Fund for Health Journalism and the National Health Journalism Fellowship, programs of the Center for Health Journalism at USC's Annenberg School for Communication & Journalism. KUNM's Public Health New Mexico project is funded by the W.K. Kellogg Foundation and the McCune Charitable Foundation. Find out more at publichealthnm.org.